I work with all types of materials and love to create new things out of the unique treasures mother nature has created from mans discarded rubbish. I started making jewellery with these sea changed gems while living in the UK in 2010, after I began collecting sea glass on the shores in Asia in 2009. Prior to having a website I sold my sea glass jewellery on my travels around the UK, from a display on the beach to a blanket at festivals. I love to spend my time on the shores looking for sea glass and other treasures. Having spent several years of my life wandering the world’s shores and oceans, observing marine life and removing debris discarded by man from the beaches and reefs. I now get to create beautiful things given to me by the ocean. I receive great pleasure from creating jewellery from Mother Nature’s efforts in attempting to keep up with mans demands and creating something so beautiful for me to work with. All of the sea glass used in my jewellery was collected by me along the North East and UK shores along with a few other locations. My background is in marine zoology (a BSc from the University of Wales Bangor), followed by a career in Marine conservation. 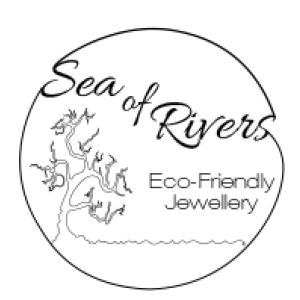 Through Sea of Rivers Creations I have brought together an appreciation for fine jewellery and my passion for marine conservation. Using material discarded by man and transformed by Mother Nature over several decades, to create something simple and unique to be treasured over time. I create jewellery in my workshop using precious metals and genuine sea glass. The main focus is on reusing and sustainable sourcing materials to use in my work, focusing on ethical and environmental awareness. I work with ecosilver, recycled fine silver and recycled copper. My work is inspired by nature and the ocean and mans overuse of materials. EcoSilver is 100% recycled alternative to sterling silver. You can treat it just like standard silver products – it has exactly the same working properties and you get the same quality results. The only difference is that it’s guaranteed to be made up of 100% recycled silver made up of scrap from the jewellery, medical, electronics and giftware industries. I also work with precious metal clay which was created in the 1990s by a company salvaging gold, silver and copper from industry and circuit boards. It is an ethical product as it is being recycled and mining has not had to take place to extract the metal. Packaging is kept to a minimum and made from recycled boxes and organza bags (made by my dear aunt) and biodegradable padded envelopes to insure safe delivery of your jewellery.